New series of "unique functional objects" has made a successful debut at my last two art shows. 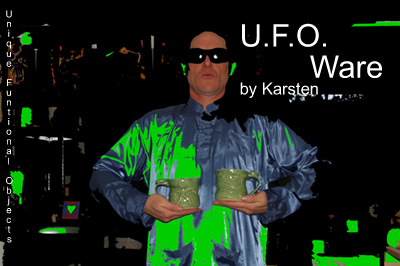 The featured mugs are generously sized with extra-large thumb-rests and a bas-relief alien. Some mugs also feature inscribed quotes on the opposite side such as "Do Aliens Dream of Humans?" and "Greetings Human". Tumblers and flared-bowls are also available in this series.